Graves' orbitopathy (GO), also known as thyroid eye disease, affects approximately 3 million people in Europe with an estimated socioeconomic burden of 6.4 billion euros per annum. GO is a complication of Graves' disease which is an autoimmune disease and the commonest cause of an overactive thyroid gland. The treatment of GO remains unsatisfactory and the majority of patients report long-term impairment of quality of life. To improve the outcomes of people with GO and thus reduce long-term illness and cost to society, research is needed to address the identification of risk factors, develop a better understanding of the pathophysiology of the disease, devise approaches for early diagnosis during the pre-clinical stage of the disease, and create novel and safe interventions. 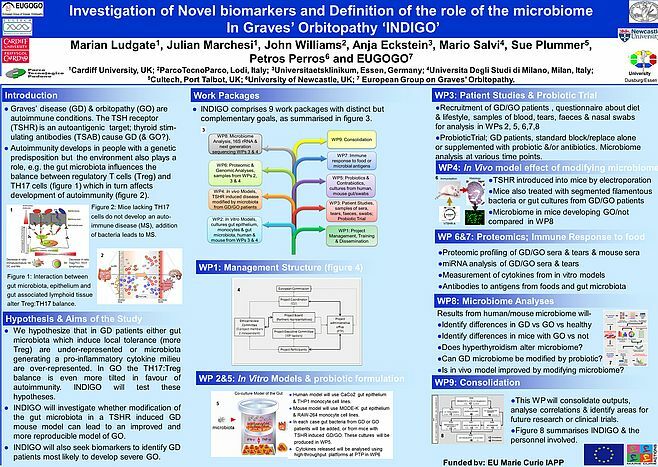 INDIGO will refine and optimise animal and in vitro models of Graves’ disease and GO, which are urgently required to facilitate the study of the pathogenesis of GO. INDIGO will address the identification of risk factors for the initiation and perpetuation of autoimmunity that causes disease, using the latest generation technologies to study variations in the microbiome in Graves and GO patients and controls. The interaction of the gut derived antigens, from micro-organisms and nutrients on the autoimmune response in both the animal model by probiotic and “contra-biotic” intervention. State of the art technology will be used to search for biomarkers that will identify patients that will progress to GO, during the preclinical phase of the disease when intervention is most likely to be successful. The successful completion of the project will be ensured by a partnership involving 2 SMEs, 3 academic institutions and the European Group on Graves' Orbitopathy, each contributing complementary expertise and technology, the project will involve 5 secondments and 3 recruitments that will facilitate the exchange of knowledge and training.